I knew that I'd made up alot of bead sets, however, not having done an actual count, didn't realize just how many. 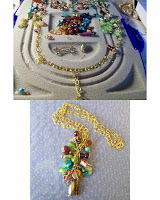 As I enjoy this color mix, I'm going to continue creating new pieces until I run short on the bead sets. This is another cascade necklace. - Cut 18" of lightweight chain from inventory. - Cut an additional 2 1/4" piece of the chain for the cascase. - Attached 20 individual bead sets with jump rings.